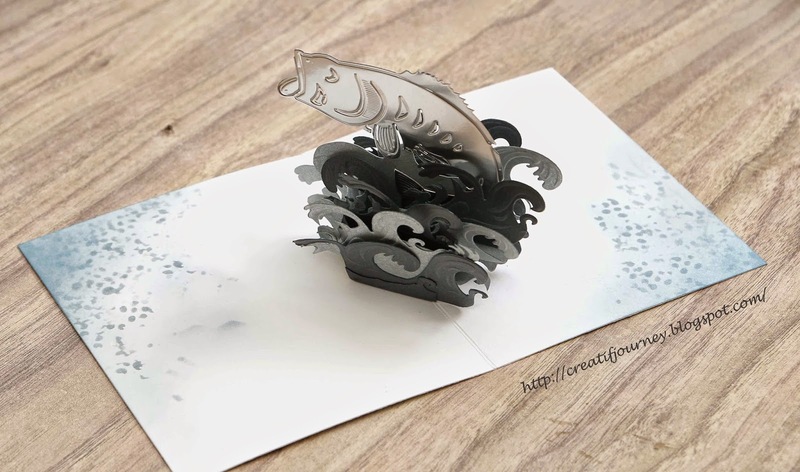 Today I have a pop-up card with a fish surfing in the wave. Close-up look of the fish. The fish is cut out from metal foil and it reflects the color of the clothing of the audience (LOL I guess you can tell that I was wearing an orange shirt while taking these photos). WOW What a fabulous guy creation! Thanks so much for playing in our ‘ANNIVERSARY’ challenge at Dies R Us! Please come back again soon! This is such a cute project!!! Thanks so much for playing along with us at the Cheery Lynn Designs challenge this week! Wow! This is fabulous!! Love it!! Great work! Mee, this is amazing, I love how you have used just the fish from the die. 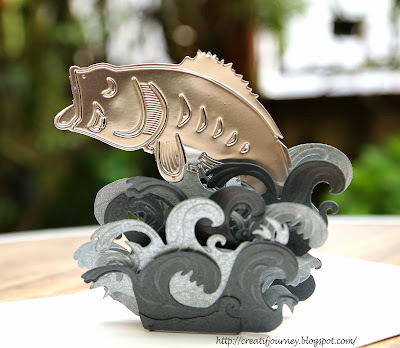 It is fabulous cut out of metal foil. Good luck and thanks for joining in on the fun at Cheery Lynn Designs challenge. This is awesome, Mee I'd love to have you share it with us at Word Art Wednesday. Always Anything Goes - Great prizes! WOW your pop up designs are stunning! Wow...so creative and fun....fabulous! Thank you for joining us at "Dies R Us" for our "Anniversary" challenge! This is stunning! Thanks for joining us at 613 Avenue Create and I hope you'll join us again soon. This is so original, a fab creation. The fish is so lifelike and I love the way you have him leaping from the waves. I also like the touches of colour you have added on the card corners. Thanks for joining in with the Sisters of Craft challenge, good luck and best wishes, Anne DT.